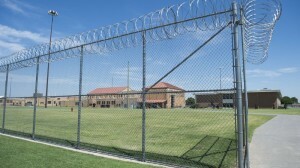 El Reno Federal Correctional Institution in Oklahoma. Thousands of prisoners nationally were just released as a result of changes to sentencing guidelines for drug-related crimes.Over the past few days, thousands of federal prisoners have been leaving confinement early and returning to their communities — the result of changes to sentencing guidelines for drug-related crimes. Over the past few days, thousands of federal prisoners have been leaving confinement early and returning to their communities — the result of changes to sentencing guidelines for drug-related crimes. And who will be monitoring those former inmates? In some ways, the buck stops with Matthew Rowland. He’s the chief of the probation and pretrial services office at the Administrative Office of the U.S. Courts. Rowland worked as a federal probation officer in his native New York for 15 years. Now he’s responsible for a nationwide team that supervises about 225,000 people accused or convicted of federal crimes every year. Rowland told NPR he’s been able to hire a net 150 new officers to help deal with the big release of drug offenders. The officers started working with many of those criminals a year ago, even before they left prison. “The officer is required to interact with them not only in the office but go out into the community and see where they’re living, see who they’re hanging around with, see the level of family support they have and then take that information into account in developing a supervision plan that tries to produce the best possible result,” Rowland said.